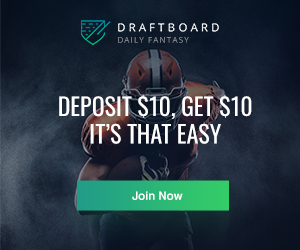 Contact Rate Risers and Fallers for Week 20: Buy or Sell? Welcome to Contact Rate Risers and Fallers! Our premium tools allow us to get out ahead of trends in player performance, including contact rate. Every Wednesday, we'll be looking at some players that have seen an increase in contact rate and some that have seen it decline. Contact rate can foretell a player's batting average and general hitting statistics, and any drastic change could signal a shift in performance. Contact rate shifts often act as a precursor to hot streaks and slumps. Here is a breakdown of some of the biggest fantasy relevant risers and fallers in contact rate over the last seven days. 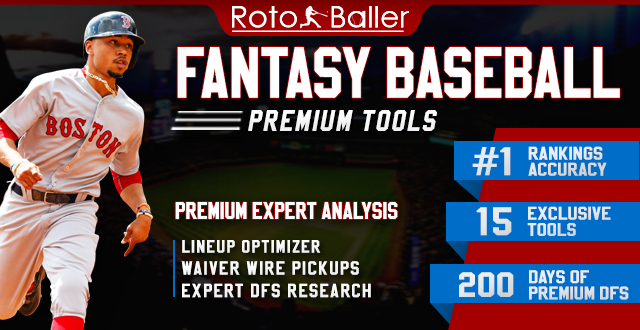 Identifying top batting average surgers for each week can help you spot the best pickups before your competition. 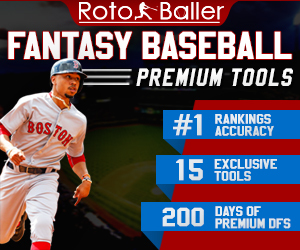 RotoBaller's Premium Contact Rate Risers and Fallers tool has you covered every day. 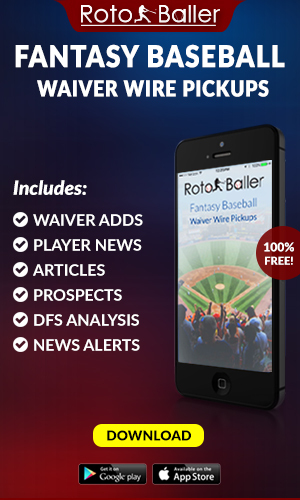 As thoughtful fantasy baseball players, we won't lead you astray. This type of data is available as part of our Premium MLB Subscription. Don't settle for basic stats and surface-level advice from other sites. 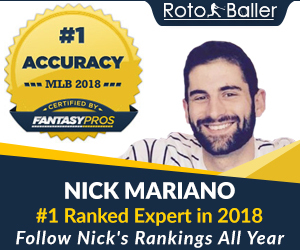 RotoBaller brings you advanced statistics and professional analysis that you need to win your fantasy leagues and DFS games because we're ballers just like you. We are your secret weapon! Franmil Reyes returned to the majors on August 5 and has clubbed three home runs since. Over the past seven days, he hit .280 with a .908 OPS and four strikeouts in 26 PA. He did all of his damage in a series at Miller Park, where he went 7-for-13 with two home runs and two doubles. He has been 0-for-13 with three strikeouts since then. Reyes’ calling card as a prospect has been power, and he followed up on a 2017 breakout with 16 home runs and a .290 ISO in 250 PA at Triple-A. He’s had a few stints in the majors this season, which have been up-and-down. The power has been there for Reyes. He has nine home runs and a .242 ISO in 140 PA, but also has a 33.6% strikeout rate and 70% contact rate. Strikeouts weren’t this big of a problem for Reyes in the minors, but major league pitching tends to be tougher to hit than minor league pitching. Reyes is selling out for power and he won’t have a high batting average with this approach. He has a .242 BA and .232 xBA, so we know what to expect from him. The Padres are going to play Wil Myers at third base in order to keep Reyes in the lineup, and he should be a fine source of power even playing in San Diego. However, he will most likely struggle to his .250. Herrera may have had a good contact rate, but it didn’t help his production. Over the last seven days, he went 3-for-21 with a .381 OPS and one strikeout. He didn’t hit the ball very hard with a 25% hard contact rate and didn’t hit it well either with a 15.8% line drive rate. The type of contact Herrera made last week was not conducive to base hits. Herrera is having his worst BA season at .269 but his best power season with a .180 ISO. He has a .306 BABIP, which is above average in most circumstances, but Herrera has a career .348 BABIP. Speedy players like Herrera often subvert norms in terms of expected batting average production. For instance, Herrera has a .237 xBA this season, which would make us think he is due for a regression from his .269 BA. However, he has a career .245 xBA and career .284 BA. Players like this can routinely outperform expected results because of their speed. Herrera makes weak contact and doesn’t hit many line drives, but he should be able to hit around .270-.280 consistently. That’s the type of player Herrera is, boring and low-ceiling, but consistently productive. Wendle has been on a tear since the beginning of July, hitting .368 with a 1.009 OPS and .208 ISO since July 1. This past week was a relative down week compared to that production, but Wendle still hit .333 with a .794 OPS and one strikeout in 20 PA. Wendle is making better contact in the second half with a 26% line drive rate and 38% hard contact rate since the All-Star break. He is riding a .357 BABIP in the second half and .355 BABIP overall this season to maintain his .294 BA. He does make contact at an 80% clip, however, his batting average is still inflated by his BABIP. Wendle has a .264 xBA, and while he probably won’t regress all the way to that, his final BA might meet in the middle around .280. He has moderate power and speed, but Wendle’s best skill will be average, and he should be a fine source for the remainder of the season. He's only 12% owned in Yahoo leagues as of writing this, so he's worth an add if you need batting average help. Hernandez had a rough week last week, hitting .211 with 11 strikeouts in 21 PA. Now, he also hit two homers and had a .883 OPS, but he struggled to hit the ball. Hernandez already doesn’t make a lot of contact. His 65.4% contact rate is the second lowest among qualified hitters, ahead of only Joey Gallo. He also strikes out 29.6% of the time, which is sixth highest among qualified hitters. When Hernandez does make contact he pulverizes the ball. He has a 92 MPH average exit velocity and 48.4% hard contact rate. Statcast loves Hernandez, and he has wide gaps between his actual stats and expected stats. His .564 xSLG and .367 xwOBA, in particular, suggest even more power could be coming from Hernandez. He may not be able to realize this potential while making contact so infrequently, but Hernandez is a good source of power as it stands and could be even better. As long as he strikes out this much he will struggle to improve upon his .243 BA. Last week Machado hit just .192 with a .530 OPS and nine strikeouts in 27 PA. He’s struggled since coming to the Dodgers, hitting .255 with two home runs and a .733 OPS since the trade. His cold stretch has come with an uncharacteristic 27.4% strikeout rate, which is really eating into his batting average. He has a .349 BABIP in the second half along with a 24.6% line drive rate, but those strikeouts have been murdering his production. Whether it’s the new team, new park, new league, or just a cold streak is impossible to say, however, there isn’t much Machado owners should do about this. Just keep starting him and trust that an MVP-caliber bat will turn things around. Eaton had another bad week last week, hitting just .167 with a .375 OPS and nine strikeouts. Eaton has put up a good batting average (.289) and on-base percentage (.372) when healthy, but an utter lack of power and steals has made him nigh useless in traditional 5x5 leagues. He has suffered multiple serious leg injuries over the past two seasons and his sprint speed has dropped by 1.4 Ft/s from its peak. We may never see fifteen or more steal production from Eaton again. His power has also evaporated this season and he has a .086 ISO, the lowest of his career. Eaton was never a big power hitter, but just three home runs in 225 PA is pitifully bad. His contact rate is still above average at 81.8% and his .287 xBA aligns with his .289 BA, but that looks like all you’re going to get from Eaton. Empty batting average has its place in 5x5 leagues, but these players are usually best in deeper leagues.